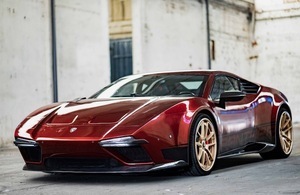 Behold: the Ares Design Panther Progettouno Coupe – a modern 650bhp V10, all wheel drive update of the legendary DeTomaso Pantera with the same engine and basic structure of the Lamborghini Huracán along with a bespoke Alcantara, Nappa leather and carbon fibre interior. Only 70 Progettounos (prices yet to be announced) will be made over the next five years. Posted in Design and tagged Panther Progettouno at 1:09 pm on March 25, 2019 by Chompsky. Rubbish. We want “Hot Heels”. This stuff is vintage eco-hostile visual and literal pollution. Even the Ford Mustang will be electric soon. And how come “Hot Wheels” never features bicycles? Put it out of its misery, Chompsky. An electric Mustang will probably burn itself in disgust. We’re charging electric cars from gas powered generating stations. It’s just moving the fuel from the forecourt to the power station. Gimmicks , Hydrogen fuel cell was the way to go but oil companies would have lost out,this way they get it both ways ,more gas and oil and vehicles that will need replacing every 5 years as the batteries and motors will cost more than the car is worth.